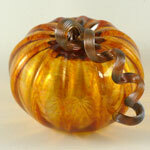 Beautiful hand-blown glass pumpkins by Luke Adams. Each is signed by the artist. 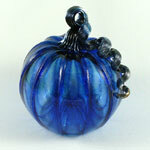 They measure approximately 6" wide and are about 6 1/2" to the top of the stem. The green twisting and spiraling stems are particularly intricate.